In automotive engineering, an exhaust manifold collects the exhaust gases from multiple cylinders into one pipe. The word manifoldcomes from the Old English word manigfeald (from the Anglo-Saxon manig [many] and feald [fold]) and refers to the folding together of multiple inputs and outputs (in contrast, an inlet or intake manifold supplies air to the cylinders). Exhaust manifolds are generally simple cast iron or stainless steel units which collect engine exhaust gas from multiple cylinders and deliver it to the exhaust pipe. For many engines, there are aftermarket tubular exhaust manifolds known as headers in American English, as extractor manifolds in British and Australian English, and simply as “tubular manifolds” in British English.These consist of individual exhaust headpipes for each cylinder, which then usually converge into one tube called a collector. Headers that do not have collectors are called zoomie headers. Ceramic paint is sprayed or brushed onto the manifold and then cured in an oven. These are usually thin, so have little insulatory properties; however, they reduce engine bay heating by lessening the heat output via radiation. A ceramic mixture is bonded to the manifold via thermal spraying to give a tough ceramic coating with very good thermal insulation. This is often used on performance production cars and track-only racers. Exhaust wrap is wrapped completely around the manifold. Although this is cheap and fairly simple, it can lead to premature degradation of the manifold. The goal of performance exhaust headers is mainly to decrease flow resistance (back pressure), and to increase the volumetric efficiency of an engine, resulting in a gain in power output. The processes occurring can be explained by the gas laws, specifically the ideal gas law and the combined gas law. 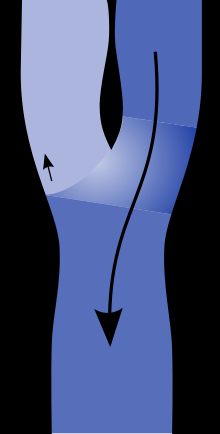 Cut through a 2-1 junction in an exhaust manifold showing pressure, which is inhomogeneous due to centripetal forces, and flow. The remaining exhaust gas forms the low-pressure tail component. This tail component may initially match ambient atmospheric pressure, but the momentum of the high and medium-pressure components reduces the pressure in the combustion chamber to a lower-than-atmospheric level. This relatively low pressure helps to extract all the combustion products from the cylinder and induct the intake charge during the overlap period when both intake and exhaust valves are partially open. The effect is known as ‘scavenging’. Length, cross-sectional area, and shaping of the exhaust ports and pipeworks influences the degree of scavenging effect, and the engine speed range over which scavenging occurs. The magnitude of the exhaust scavenging effect is a direct function of the velocity of the high and medium pressure components of the exhaust pulse. Performance headers work to increase the exhaust velocity as much as possible. One technique is tuned-length primary tubes. This technique attempts to time the occurrence of each exhaust pulse, to occur one after the other in succession while still in the exhaust system. The lower pressure tail of an exhaust pulse then serves to create a greater pressure difference between the high pressure head of the next exhaust pulse, thus increasing the velocity of that exhaust pulse. In V6 and V8 engines where there is more than one exhaust bank, ‘Y-pipes’ and ‘X-pipes’ work on the same principle of using the low pressure component of an exhaust pulse to increase the velocity of the next exhaust pulse. Great care must be used when selecting the length and diameter of the primary tubes. Tubes that are too large will cause the exhaust gas to expand and slow down, decreasing the scavenging effect. Tubes that are too small will create exhaust flow resistance which the engine must work to expel the exhaust gas from the chamber, reducing power and leaving exhaust in the chamber to dilute the incoming intake charge. Since engines produce more exhaust gas at higher speeds, the header(s) are tuned to a particular engine speed range according to the intended application. Typically, wide primary tubes offer the best gains in power and torque at higher engine speeds, while narrow tubes offer the best gains at lower speeds. Many headers are also resonance tuned, to utilize the low-pressure reflected wave rarefaction pulse which can help scavenging the combustion chamber during valve overlap. This pulse is created in all exhaust systems each time a change in density occurs, such as when exhaust merges into the collector. For clarification, the rarefaction pulse is the technical term for the same process that was described above in the “head, body, tail” description. By tuning the length of the primary tubes, usually by means of resonance tuning, the rarefaction pulse can be timed to coincide with the exact moment valve overlap occurs. Typically, long primary tubes resonate at a lower engine speed than short primary tubes. Some modern exhaust headers are available with a ceramic coating. This coating serves to prohibit rust and to reduce the amount of heat radiated into the engine bay. The heat reduction will help prevent intake manifold heat soak, which will decrease the temperature of the air entering the engine. Crossplane V8 engines have a left and right bank each containing 4 cylinders. When the engine is running, pistons are firing according to the engine firing order. If a bank has two consecutive piston firings it will create a high pressure area in the exhaust pipe, because two exhaust pulses are moving through it close in time. As the two pulses move in the exhaust pipe they should encounter either an X or H pipe. H-Pipe Selection. This type of exhaust is installed to quiet the noise. The main idea was to connect 2 exhaust pipes in order to effectively enlarge the exhaust. Also, such setup allows exhaust pulses effectively exit through two sides of the system, as when two cylinders located next to each other fire and exhausts go to one bank, the second bank is not operating. This exhaust type not only reduces sound, but also increases power by allowing the back pressure escape through the other part of the exhaust. Though, when engine runs at higher RPMs, the H-pipe starts operating less effectively because of the increased velocity of exhaust gases that do not turn to the H-pipe, but take the path of least resistance and travel straight to the exhaust tip. X-Pipe Selection. This exhaust type may be truly considered a more effective alternative of the H-pipe. The X-pipe design requires two parts of the exhaust to be not just connected, but merged. This ensures easier flow of exhaust gases from any exhaust bank to any of two exhaust pipes. This equalizes the pack pressure and prevents that power loss regardless of the RPM. When they encounter the pipe, part of the pulse diverts into the X-H pipe which lowers the total pressure by a small amount. The reason for this decrease in pressure is that the fluid (liquid, air or gas) will travel along a pipe and when it comes at a crossing the fluid will take the path of least resistance and some will bleed off, thus lowering the pressure slightly. Without an X-H pipe the flow of exhaust would be jerky or inconsistent, and the engine would not run at its highest efficiency. The double exhaust pulse would cause part of the next exhaust pulse in that bank to not exit that cylinder completely and cause either a detonation (because of a lean air-fuel ratio (AFR)), or a misfire due to a rich AFR, depending on how much of the double pulse was left and what the mixture of that pulse was. Today’s understanding of exhaust systems and fluid dynamics has given rise to a number of mechanical improvements. One such improvement can be seen in the exhaust ultimate power valve (“EXUP”) fitted to some Yamaha motorcycles. It constantly adjusts the back pressure within the collector of the exhaust system to enhance pressure wave formation as a function of engine speed. This ensures good low to mid-range performance. At low engine speeds the wave pressure within the pipe network is low. A full oscillation of the Helmholtz resonance occurs before the exhaust valve is closed, and to increase low-speed torque, large amplitude exhaust pressure waves are artificially induced. This is achieved by partial closing of an internal valve within the exhaust—the EXUP valve—at the point where the four primary pipes from the cylinders join. This junction point essentially behaves as an artificial atmosphere, hence the alteration of the pressure at this point controls the behavior of reflected waves at this sudden increase in area discontinuity. Closing the valve increases the local pressure, thus inducing the formation of larger amplitude negative reflected expansion waves. This enhances low speed torque up to a speed at which the loss due to increased back pressure outweighs the EXUP tuning effect. At higher speeds the EXUP valve is fully opened and the exhaust is allowed to flow freely. Zahl, Timothy (18 August 2015). “Dual Exhaust System Types: X-Pipes vs H-Pipes”. CARiD.com.